Bangalore-based B2B travel company Flightraja Travels Pvt. Ltd. (Via), which runs ticketing portal Via.com and a network of 50,000 offline and online travel partners in India, now wants to become an all encompassing e-commerce brand - an Amazon, GroupOn and Travelocity all rolled into one. This is arguably the first such Indian firm to make such an attempt, but it also marks a departure from the established trend where online booksellers transformed themselves into general e-commerce firms. To begin with, Via has forayed into daily deals segment with Deals More and a travel deals sub-site called Travel More. 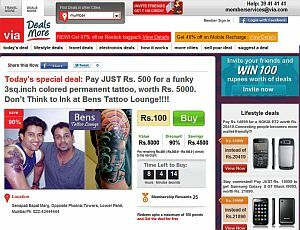 Deals More reaches out to 10 cities - Bangalore, Delhi, Mumbai, Kolkata, Chennai, Hyderabad, Ahmedabad, Pune, Jaipur and Chandigarh. Discounts of up to 90 per cent will be made available on services such as restaurants, spas and beauty services. It also offers deals on products such as sunglasses, mobile handsets and Tablets. "Deals More is the first move; Travel More is the next. Via will become an e-commerce site on retail, selling everything from tickets to books to apparel," said Ayush Aggarwal, Digital Product Manager for Via.com, speaking to Techcircle.in. Deals More took three months to execute and while Aggarwal did not reveal the investment that went into it, the company has over 200 feet on the street to source deals. There is no separate team for e-commerce. Via employs another 300 across its operations. Vinay Gupta, CEO, Via, said, "Deals More will draw consumers' attention. Retailers will quit all deal sites and shift to Deals More." Via will be leveraging its existing partner base - which is 50,000 strong - to source deals. Aggarwal did not reveal the non-travel partner base. But why is Via getting on board the deals wagon now? The company says it wants to grab a share of the B2C pie. In response to Techcircle.in's further probing, Aggarwal said, "We want to expand our horizons. The deals market was open and we wanted to capture it. Via was succesfull in understanding the consumer for four years and we want to bring this to the deals segment. In deals, we have a focussed platform attending to the B2B section, merchants as well as consumers. We will offer exclusive deals at an exclusive price. " On Via's USP in the daily deals segment, Aggarwal said, "The key to succeed in services is quality of merchants. Other deal sites have not focussed on it so far. If you want a good discount, you also want to get the right product: this is what we will deliver." The company has opted to keep Deals More and Travel More as sub-sites rather than launching a separate e-commerce portal. Aggarwal explained, "We do not want consumers to go away from the main site - they can log onto Via.com and see all our products on the same domain." He believes this move will help Via in being regarded as an e-commerce brand. Now Via is targeting a milestone of 10,000 transactions per day by the next two quarters. The company claims that on the day of its launch, it sold 1,000 deals, primarily in the products and beauty categories. Via has to compete with various e-commerce start-ups that have risen in the past year and Snapdeal.com is its prime competitor. "Snapdeal.com has a good customer base which it is establishing with a lot of marketing. There are others coming up and everyone has a fair chance of winning in this segment. It will all come down to the quality of service and how well you understand the customer," he said. Via was founded by Vinay Gupta and Amit Aggarwal in July 2006 and incorporated in May 2007. As of 2010, the company claimed an annual sales revenue of $500 million. It is backed by Indo US Venture Partners and Sequoia Capital and is now learnt to be raising $100 million to expand to more countries. It currently reaches users in 2,000 cities. Meanwhile other travel firms continue to acquire smaller companies to plug their gaps. Recently, hotels aggregation site Magic Rooms Solutions India, which was founded by Niranjan Gupta, co-founder of Via, was acquired by Gurgaon-based online travel agency Yatra Online Pvt Ltd. MagicRooms was launched in 2009 and last year got Rs 7 crore in funding from Nexus Venture Partners. Rival Makemytrip and its largest shareholder - private equity firm SAIF Partners - acquired a majority stake in Gurgaon-based Le Travenues Technology Pvt Ltd, which owns and operates travel search engine iXiGO.